Skechers's marketing pitch: Enhanced cushioning to go the distance. Upper: Mesh, synthetic leather, fused overlays. Midsole: Injection molded EVA foam, 4mm heel drop. Outsole: Circular rubber pods, EVA foam. Widths available: Standard only. Additional room can be created by using the shoe without the custom fit insole. Skechers might not have changed the GoRun Ride 4's outsole, but still comes out on top with a vastly improved upper and updates to the midsole foam material. As a performance brand, Skechers is gradually coming of age. The GoRun Ride 4 is here, and it is definitely an improvement over last year’s version. An update which improves the quality of overall upper fit, and while at it, the ride quality as well. 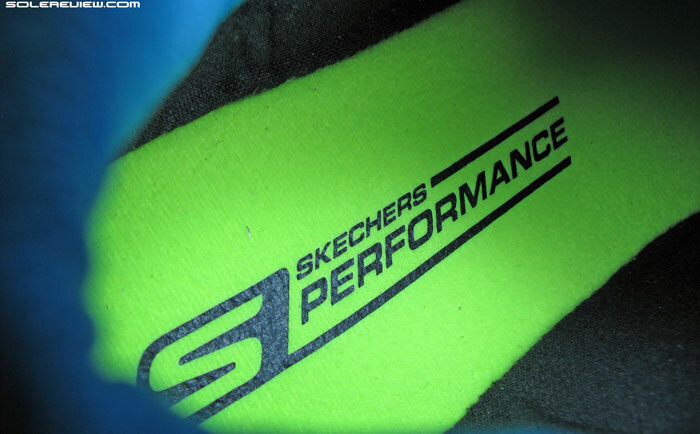 Now the latter part is interesting, because Skechers hasn’t changed the midsole design at all. However, even with a carry-over design, the option for material change is always available, one which Skechers wisely chose to exercise. 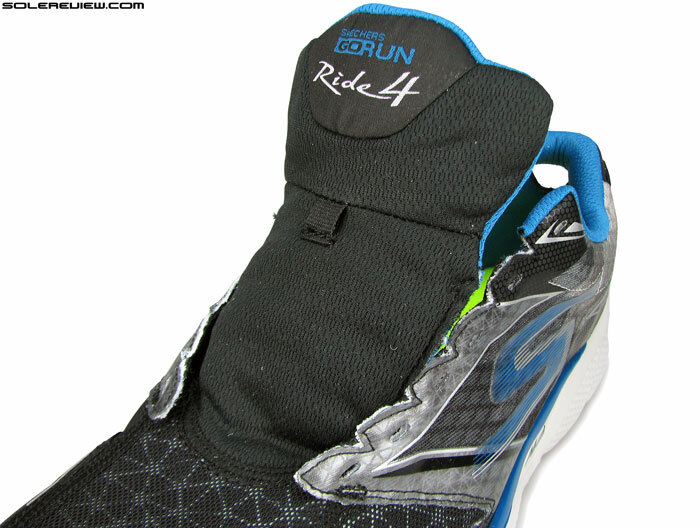 The Ride 4 is a 4mm drop, neutral cushioning trainer. When you cut through the clutter, Skecher’s performance running line can be condensed into just three shoe models – the GoRun, GoRun Ride and the GoMeb speed. All three have been recently refreshed with changes for the 2015 season, with the GoRun 4 and GoMeb Speed 3 tied by a common design language. In this assortment, the GoRun Ride 4 is a ‘comfort’ version of the GoRun 4, which happens to be a minimal speedster. Perched at top of the pricing pyramid is the $120 distance racing GoMeb Speed 3, a signature shoe which Meb Keflezighi won his Boston Marathon and placed 4th at NYC in. As far as the Ride Ultra update is concerned, there’s no word yet. GoRun Ride 4 also happens to be the cheapest of the trio, with a MSRP of $85. This kind of pricing is one of the reasons which makes Skechers popular, though when judged from a price-value lens, it fares neither better or worse than other brands. To illustrate our point, Nike also offers $80 shoes like the Dual Fusion Run 3 and Zoom Fly, both of which offer a comparable level of materials and feature set. It is just that most of Skecher’s line is priced sub $100, making the entire brand seem value for money. The fourth version of GoRun Ride makes a ton of updates to its upper. The headlining act for this year is GRR 4’s new upper, which comes equipped with a plethora of design updates, all of them noticeable move-ups in fit, feel and aesthetic. This is a sign that Skechers is taking its recently earned performance positioning seriously, making the most of athlete insights and in-house footwear talent. (We’ve talked about this in more detail here). However, they still need some more time to hone their craft, as evident from a few design flaws noticed across their ‘Go’ running line-up. When compared to GRR3, improvement on heel fit and feel is noticeable. 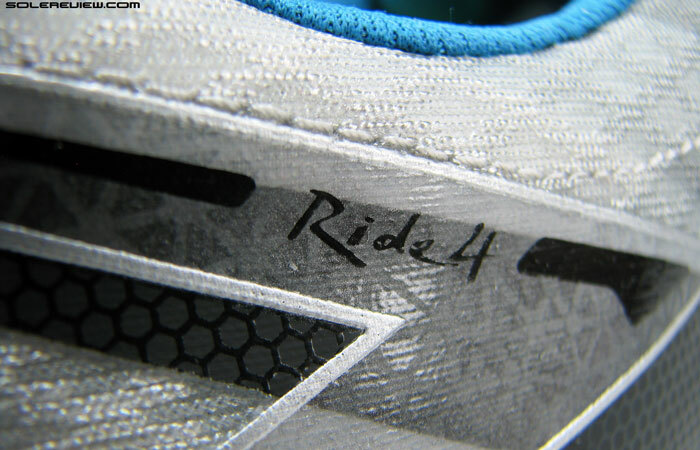 Out of all the updates which roll in on the Ride 4, the most important of all would be the shoe’s revised collar area. In essence, the collar area molding is now narrower than ever before and features higher side walls. There’s a marginal increase in upper heel height on outer (lateral) and inner (medial) sides, while the Achilles dip goes much higher when compared to GRR3. Collar walls are raised higher than last year. The Achilles dip at top gets higher, and now features a shallow curve. Benefits of the said updates are two fold. 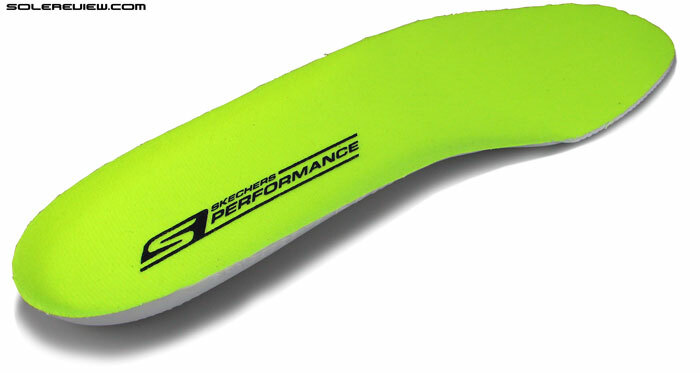 The 2014 GoRun Ride 3’s back heel point was shallower, hence coming in contact with the upper curve of heel bone. 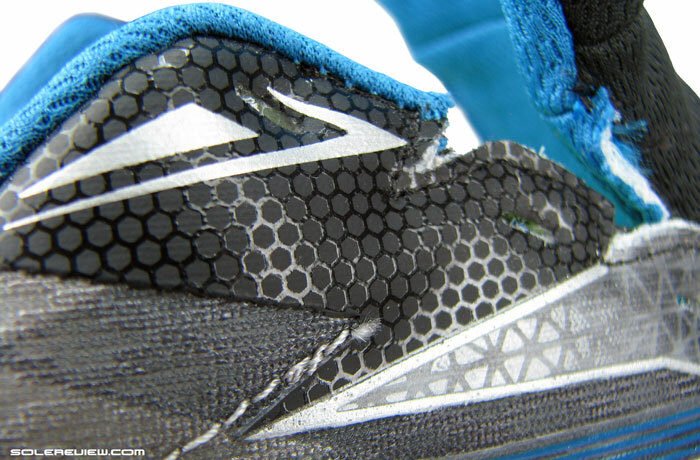 This led to a part of the fabric collar resting on the Achilles during runs. The GoRun Ride 4 moves the Achilles point upwards, and also builds in a dip into the pattern design. This stops the back of upper heel to prematurely rest on the Achilles, and you can no longer feel upper coming in contact with that area. Frankly, we did not think much of it on last year’s Ride 3 as it caused no discomfort. It is only when you wear the new Ride 4 that you appreciate this subtle change. The spread of foam inside the collar has been improved. A little wider, instead of being tightly packed along the edges. The Ride 4 is missing the last row of eyelet which the GRR3 had. The higher collar walls and narrower molding improves the quality of fit around the ankles. Foam padding inside the collar has also been toyed with, spreading it wide instead of concentrating it in the upper reaches like the GRR3. As a result of these updates, the overall experience in that area is vastly improved, though we have to say that Skechers should be have retained the last row of eyelets from GRR3. Just gives runners another level of fit customization in case the circumstance demanded it. 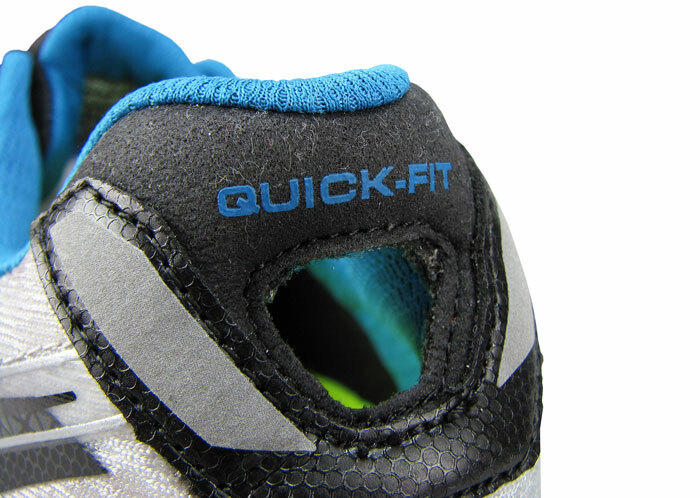 ‘Quick-Fit’ is an opening meant to stick your index finger through and pull the heel over. You’ll notice an opening cut out right under the Achilles dip. This doesn’t affect the fit for better or worse. It’s sole purpose is to make the process of putting the shoe on easier. When you’re ready to go for a run, just slide your finger inside the upper, pass it through the hole with a hook like action and then pull the shoe over your heel. It is a nifty feature, which also makes the heel area look slimmer. 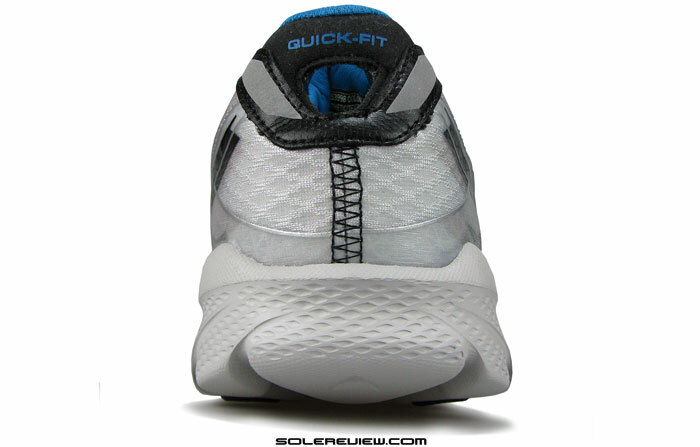 Skechers aptly names this design element as ‘Quick Fit’. Reflectivity levels are turned up on the Ride 4. Two angular pieces flank the ‘Quick Fit’ opening and that’s balanced with another pair on the toe bumper. Upper switches to the use of fused overlays. Cosmetic details are enhanced by printed textures on the upper layer. Keeping in line with going-ons in the rearfoot, the entire upper sheds a lot of aesthetic and actual bulk. There’s more of high density printing on midfoot panels, replacing the completely stitched-on equivalent of the GRR3. The pattern designs also take on sharper lines, some of the overlays placed in angular intersections. 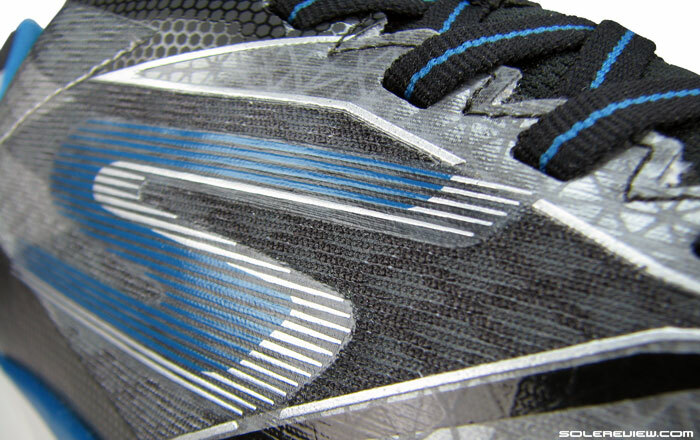 The Skechers ’S’ logo is now a welded overlay on either sides, acting both as visual slimmers and structural support. For added cosmetic detail, the fused film-thin overlays have diamond shaped, printed textures on them. Toe bumper is made sleeker, and its sides stretched up. Tongue remains un-gusseted, but with material change. Top mesh and lining is softer than Ride 3. And plenty of foam padding to go, too. 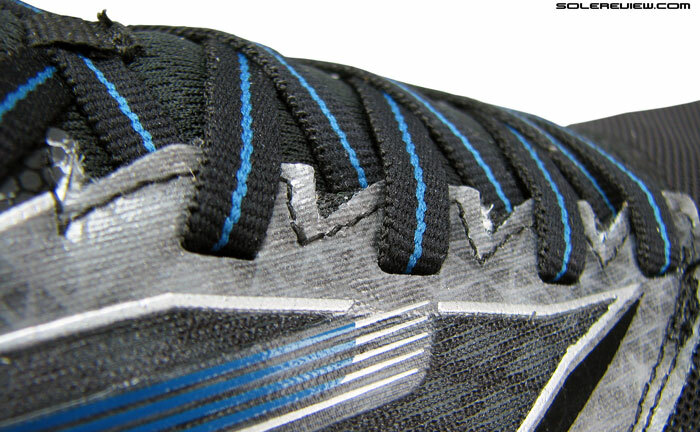 Lacing width (distance between opposing eyelets) is made narrower. The synthetic leather toe bumper has been redesigned, its pointy ends made sleeker and pulled upwards on the toe box. Lacing width is also reduced, the eyelets now closer to each other across. Tongue design is more or less the same, unattached to the sides, but has updated mesh making up its top and lining. The new material has a softer hand feel, and when combined with the foam inside, goes over the foot in comfort. Unfortunately, tongue slide repeats itself on the GoRun Ride 4, as the lack of a sleeve makes it free to go sideways at will. 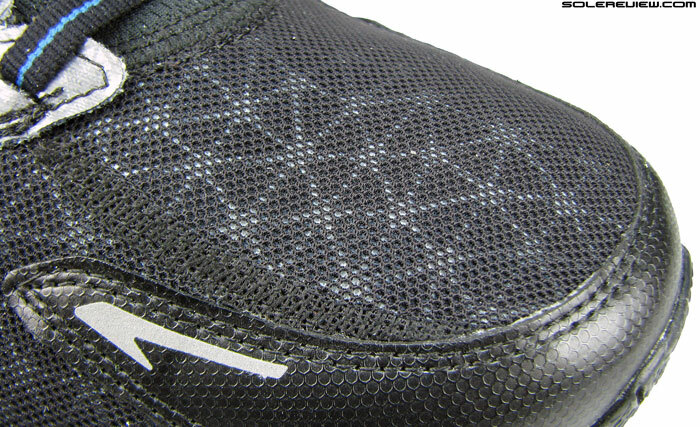 Forefoot mesh with diamond patterned undertones replaces the previously stretchy mesh. Ride 4 gets a lining upgrade. 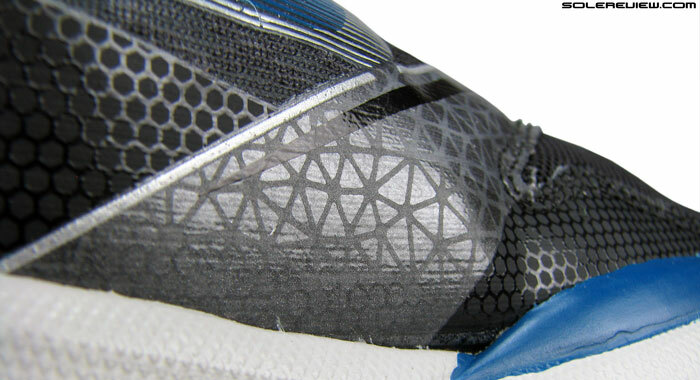 Forefoot mesh material sees a complete overhaul. 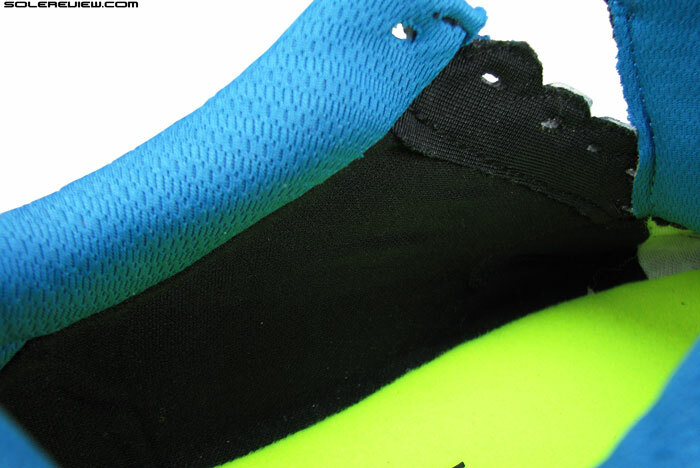 The stretchy mesh seen on the GRR3 toe box no longer exists, and in its place is a fabric with lattice-like texture. This is a close knit structure, so like the GRR3, the Ride 4 will run slightly warm, and only more so. 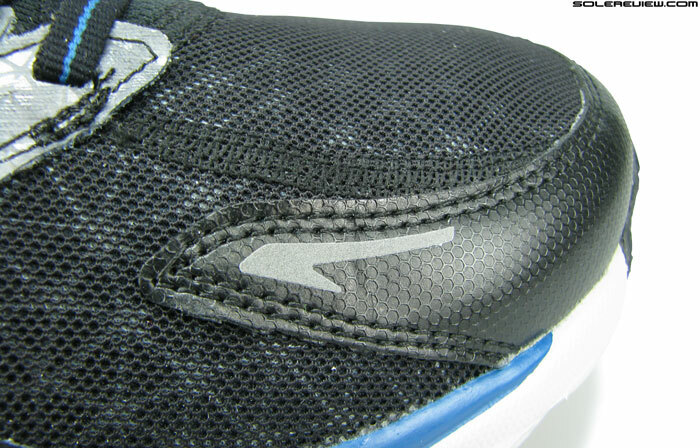 Also know there are additional mesh panels of inner lining spanning from forefoot to rear. This is definitely an upgrade over GRR3’s unlined upper, and comes with obvious fit upsides. However, it gets in the way of ventilation, so if you happen to be running in warmer climes, it would help to keep a mental note of this aspect. All these changes marry well together, and the fit comes across as noticeably improved. The lining and choice of materials has the effect of making the upper feel closer to the foot, but paradoxically has a roomier feel to it, especially in the forefoot. 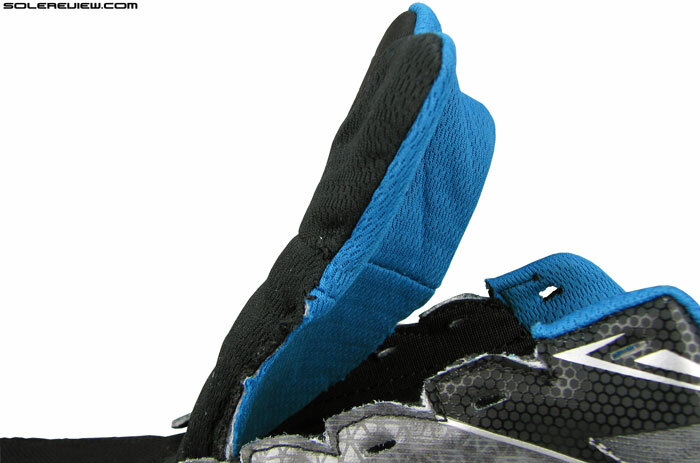 With toe bumper’s flanks stretched upwards, there’s a greater area of open mesh area on the sides. Add to that revised midfoot overlays, which instead of pinning the foot down, molds over it due to increased material flexibility. So runners who appreciate forefoot splay room will find the GRR4 equal to the task. In addition, the shoe now feels good when worn barefoot, compared to the less than ideal sock-less compatibility of its previous self. Like the GRR3, this shoe comes with an extra set of insoles. We feel the GRR4 is best experienced with these sockliners utlilized. 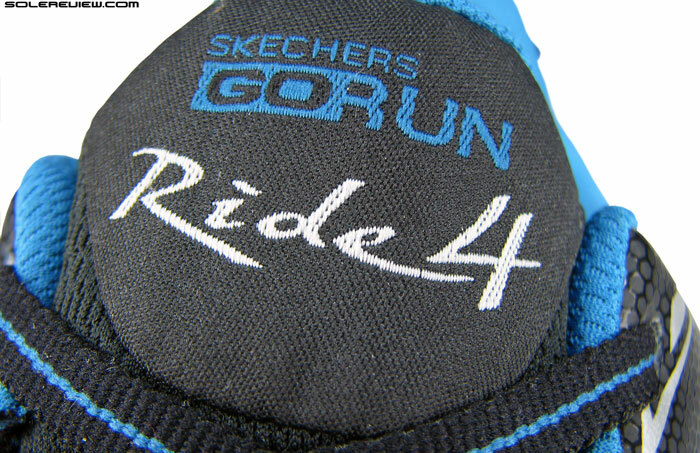 If you were into the Skechers GoRun Ride 3, you’ll be familiar with the additional pair of ‘custom insole’ provided with the shoe. 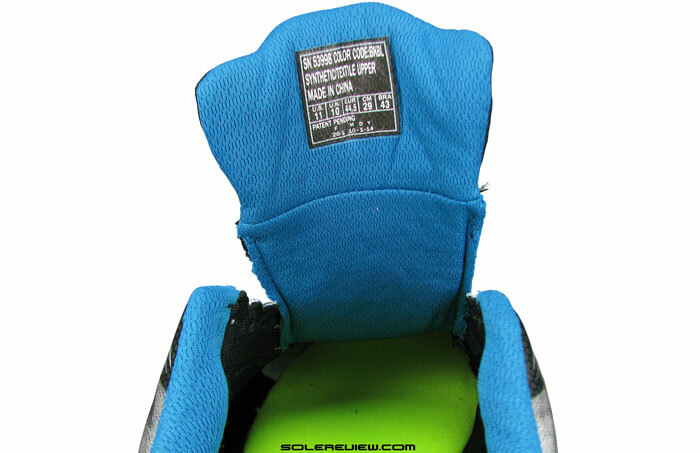 Our fit experience and assessment is based on using this insole, as we felt that it resulted in an optimal level of fit. Of course, you are free to use the shoe sans the insole, and while it does not make the upper fit very baggy, it just doesn’t feel as sorted as having the insole in. Lack of insole also affects the ride quality, and we’ll touch that subject in a later part of this review. If you don’t use the insole, this is what you get. A branded strobel which works as a footbed. The removal of custom insole would leave you with a padded strobel, which doubles up as the footbed. This customization option might be particularly useful for runners who are seeking a wider fit, as Skechers only offers a single width in their models. The only compromise is that having no insole will create room all over the shoe. This differs from a ‘width’ option, where brands usually open up just the forefoot and keep other areas unchanged in fit. One has to also consider the fact that the GRR 4 in its insoled version runs true to size. Without the insole, there’s plenty of space ahead of the big toe, and some runners might feel the need to buy half size down. 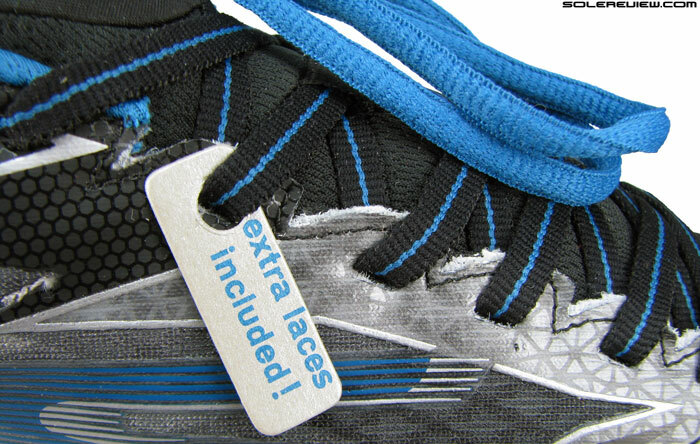 Speaking of extras, the GoRun Ride 4 also comes with an additional set of laces. We loved the default flat lacing on the GRR4, but no harm in having something extra to go, is there? The surprise on the GoRun Ride 4 is its changed ride behavior. Surprising because the shoe carries over the exact same 4mm drop midsole design from GRR3. 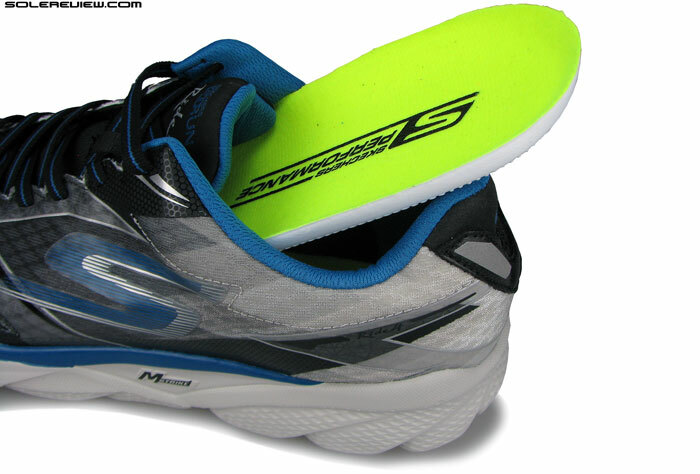 The difference, however, lies in the increased firmness of Ride 4’s foam which Skechers calls Resalyte. The midsole hardness is a step over last year’s softness, and that leads to a difference which is instantly noticeable, even on your first outing. 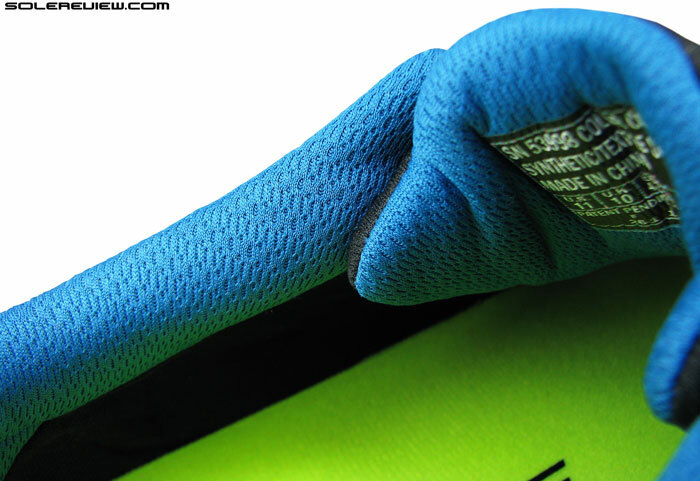 With the custom insole fitted in, the GoRun Ride 4’s cushioning now behaves with a higher level of responsiveness. We also felt the GRR 4 to be a better pace tool than its predecessor, the new found firmness helping in smoother transitions. 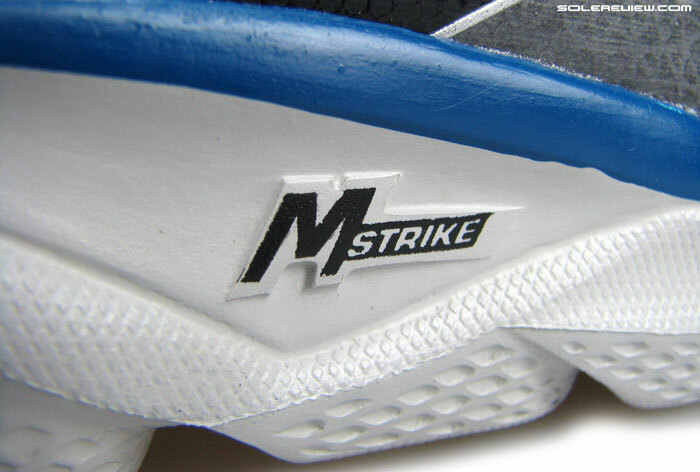 The midsole has that rocker shape, which Skechers says ‘promotes mid-foot’ strike. To that, we say the same thing which we said of the GRR3 – the most it will do will be to affect a late-stage rear-foot strike. Same midsole/outsole design carries over. The midsole foam is firmed up, yet still cushioned. Makes the shoe more responsive. 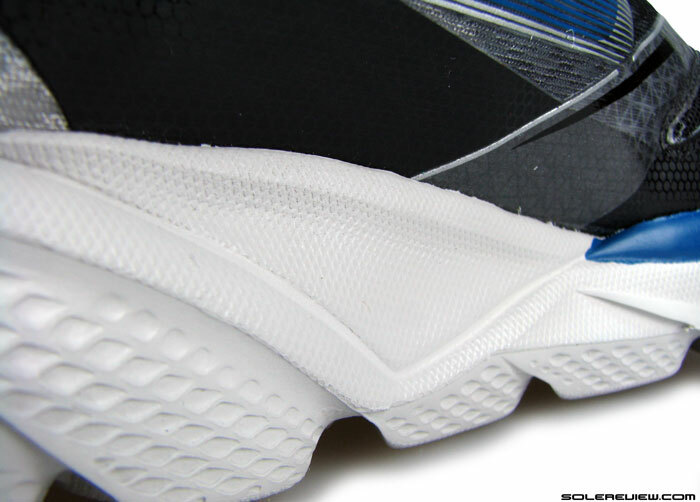 The outsole is largely EVA foam, with circular rubber pieces embedded in foam pillars. As was the case with Ride 3, EVA at the footstrike area will see quick, initial shredding after which it slows down. 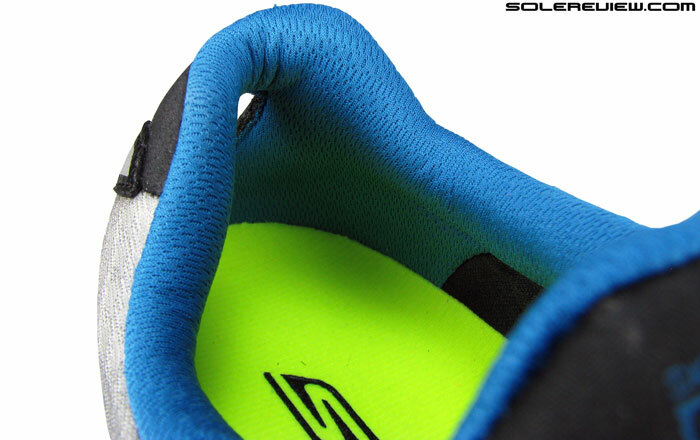 We’d like to specifically point out that the cushioning feels best with the custom insole popped in. Without that, the shoe is robbed of its responsiveness, and feels flat. Our recommendation will be to use the shoe with the custom sockliner, which yields best results both from an upper fit and ride viewpoint. 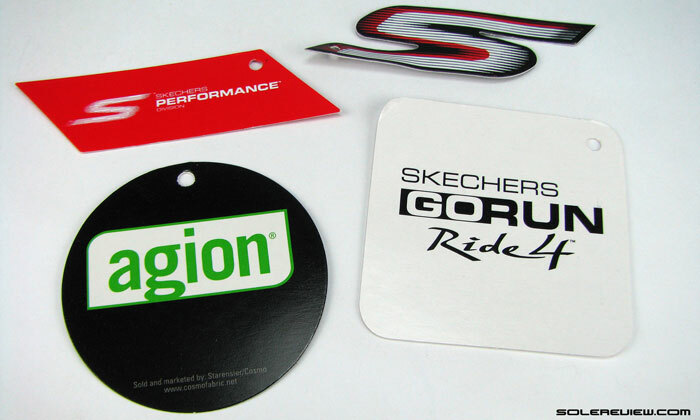 Skechers carries over the tradition of branding paraphernalia accompanying the shoe, with a bunch of paper labels tagged to one of the eyelets. They aren’t a complete waste of paper; the shoe uses Agion Odor performance, which is mentioned nowhere else on the shoe, but green texted on a circular label. The box also comes with a small, printed catalogue of Skechers products, though the one which we got with Ride 4 wasn’t updated with latest models. Regardless of Skechers deciding to do an upper only design update on the GoRun Ride 4, the raft of tweaks is meaningful in nature. This yearly refresh focuses on both form and function, and we like what it’s done to the GRR in terms of improving real world performance and build quality. The GoRun Ride no longer feels like a cut price running shoe with sloppy design and flimsy upper construction. Instead, it looks like a shoe with a certain amount of design thinking factored in, giving the product a finesse which was lacking before. This reflects the brand’s sincere efforts to make their products better, and in the end, that is all what really matters. I’d tried on the GRR3 but they felt the same and a bit “bloated” so it’s good to hear there is some improvment in the GRR4. Looking forward to reading your GoMeb Speed 3 review. I got the GoMeb Speed 2 for 10k races and they felt fast but for some reason (drop too low?) my achilles get really sore when I use them, unlike with the Adios Boost 2. You’ve used the right word, ‘bloated’, for GRR3. In this version, there’s less of that going on. GoMeb Speed 3 is ok, though the upper quality is top notch relative to Skechers. One big red flag with the GMS3 is the way it flexes – the midsole does so in the center, which is a no-no for PF. The low drop could be it; after all, the Adios stacks pretty high in the back. I would speculate that the cushioning of this shoe is enough to maybe avoid the feeling of a lump underfoot, did you find it very noticeable when running? Lumpy underfoot? No, we did not feel it at all, with or without the insole. I’m using a gorun ride 4 at the moment. The thing is, i ain’t really a runner as such. I basically bought it as a confortable daily wear shoes (running and walking). The problem is for me it feels a bit uncomfortable actually (i used to wear flat sole shoes like converse, adidas originals and flip flops). I can feel the lump and my heel is also sore when i take my shoes off after a normal day. My question is, should i keep wearing these shoes till my feet get used to it or just discard it (they feel uncomfortable most time right now)? In addition, my ankle and calf muscles are slightly in pain after a regular day. If it has already been a while, would make sense to stop using these shoes. The Ride 4 has a 4 mm heel to drop, which means it is putting stress on your Achilles and calves, which might not be conditioned enough. But I’m using the provided insole so doesn’t that make it an 8mm drop? Could you help me understand why I don’t have any pain with sneakers but have pain with these shoes (considering sneakers are generally more flat). When I wear the gorun ride, it feels as if the heel (atleast the edge closer to the middle part of the foot) is always in contact with the ground. Is that a good thing? An insole will increase stack heights (near) equally from heel to forefoot, so the heel drop (slope from heel to toe) won’t be affected. It is possible than weight loading is causing the rocker shaped heel to flatten out, resulting in strain on your Achilles. But shoes are complex things, and many factors come together during usage. The bottomline is, if a particular shoe is causing discomfort, better to discontinue usage. I just bought a pair of these at under 1/2 the retail price listed here at a ‘famous’ discount retailer. Isn’t that a sweet deal! Appreciate your feedback, but you are misinterpreting our scorecard. People look for different things while buying a shoe, and the ‘feel’ of under arch support is one of the factors. That is what we call out, and the scorecard is called ‘sensory’ for good reason. Putting the insole does not increase the heel drop by additional 4mm. It just increases the stack height. The thickness of insole is uniform along the length, hence the offset does not change. hi – i totally stand corrected on the insole point! i had two previous pairs of skechers where the insole added 4mm of drop – bionic trail and go run ultra, and i just presumed that it was the same with the go run ride 4. apologies! however, i still feel my point stands about the arch. more appropriate in my opinion would be none/lots, or low/high – poor/great adds bias and weight, with ‘poor’ being pejorative and ‘great’ being positive. this might convince lots of runners to buy shoes with lots of arch support, and shun those with little. Thank you – you have a valid point and is constructive criticism – this is exactly the kind of stuff which makes solereview better. We will change the language to ‘high’ and ‘low’ from the next review onwards.